At 439 feet (134m) above sea level, the Jebel Al Dukhan hill is the highest point in Bahrain. Translated from Arabic, Jebel Al Dukhan means 'Mountain of Smoke', named for the haze which often surrounds it on humid days. There are various undetermined caves in the area for visitors to explore. Roughly a mile (2km) away, the Tree of Life stands alone in the desert, its water source a complete mystery. The mesquite tree is said to be around 400 years old, and stands 32 feet (10m) high. There is nothing else nearby to see or do. 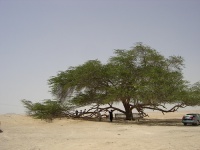 However, the mysterious tree is a popular sight for tourists in Bahrain.